Adventures | A Guide to Prince Edward County, Ontario. Original post from June 2015. The County has exploded since then! You best get out there and check it out for yourself and send me your new and favourite spots. As promised, the guide to Prince Edward County a la Swell Made Co. is ready to go. I mentioned I would share my favourite spots a while back when we introduced our lovely stockist, Kokito. That was shortly after a night away in May; but really, I should have posted this over a year ago after spending a week in the County in August 2014. Updated after a week visit in July 2016. Prince Edward County is a quick 2 hour drive from Toronto (2.5 hours from Ottawa), but once you're there you'll feel like you've traveled a lot further. The landscapes are stunning, the pace is slow, everything you eat or drink is bursting with local flavour. The quaint communities are teamed with gracious hosts and big-city expats (a common story, which I love). The one thing that makes Prince Edward County so memorable is the beautifully simple pleasures you'll experience over the course of your stay. From soaking in the sun on Norman Hardie's vineyard patio while you sip wine and eat wood-fired pizza, to bouncing down the sandbanks into the lake. This IS the good life. Don't be surprised if you find yourself dreaming about real estate. This is Ontario's (and Canada's) emerging wine country. If you're heading to the County, you'd best get to know it because this region will change dramatically over the next 10 years as vines age. This region is known for it's cool-climate grapes and terroir of clay and limestone. It's also known for producing acclaimed Chardonnays and Pinots, but that's not all. Here are a few of my suggestions. There are over 40 wineries in the County. There are many options for visiting the wineries in Prince Edward County. You can go slow and tour them at your own pace over the days or week by car or bike (yes, bike!). Or, you can plan a tour. We've done both and I would highly recommend a tour. It's a unique experience that will allow for a peek behind the scenes at many wineries, plus you'll receive one-on-one attention from the pros. Another PEC pioneer and internationally acclaimed winemaker, Norman Hardie takes pride in creating wines that taste of a place, and raise the bar on quality year, after year. His Chardonnays and Pinots are some of the most Burgundian you will find outside Burgundy, France. Visit The County Cider Company near Waupoos Estate to try the famous and mouth-watering ciders. Located on the picturesque shores of Lake Ontario, you can grab a seat with a view and relax while tasting the cider and nibbling on snacks like hummus, local cheese and sausage. It's the perfect way to spend an afternoon. Just ask if they can start bottling the Blackberry Sage cider (only on tap for now). As mentioned, there are over 30 wineries on the Island. Create a plan of attack. Other notable wineries are Devil's Wishbone, Keint-He, Sandbanks Winery, The Old Third, Closson Chase, The Grange (perfect picnic spot) and Hubb's Creek. I could go on... Do you have suggestions? Please comment below. Drake Devonshire in Wellington, Prince Edward County. Either choice is good. Posh or humble, there are many options for places to enjoy your stay in the County. No matter what you choose, you'll be greeted with open arms. From hotels to camping to AirBnB, there's something for every type of traveller. Studio House is an 1860's open concept converted carriage house. Fully restored and owned/operated by local artist Stewart Jones and Rebecca (who also operates Picnic Food Truck... see below). This rental is a modern gem in the heart of Wellington and the County. It can easily accommodate a family or group. You'll also be able to view local art for purchase in the space. An innovative Boutique Bed & Breakfast enhanced with a French gourmet food shop and Art gallery space (featuring local art), located in the heart of Prince Edward County, ON in Bloomfield. The hosts' goal is to marry the French "art de vivre" to the best of the Canadian country lifestyle and it comes through in the stylish decor and relaxed setting. Tomatoes at Norman Hardie. Get on my pizza! Let's just say the County won't leave you hungry. Local delights are bountiful and it will be one of the highlights of your stay. There is something to discover in every corner of the region from fine dining to berry picking. Follow the Taste Trail and you'll hit all notable spots. Stop at a produce stand and pick up the night's dinner, or a full picnic. The County is also dotted with fine cheese shops, bakeries, etc. Don't forget the wine! How's that for eating local? In particular, Vicki's Veggies has a plentiful offering of fresh goods. If you're heading back to Toronto, you can also find their stand stocked at Evergreen Brickworks throughout the year. A visit to the County wouldn't be complete without a stop at Slicker's Ice Cream. It's hard to miss in Bloomfield. Look for the sweet little yellow shop (on the corner) complete with an ice cream bench for an equally sweet treat. Cool down and enjoy the Campfire Marshmallow, or whatever flavour you choose. Sandbanks Provincial Park, Prince Edward County. RUN! Slow down. You're in the County now. Remember you're here to soak in the simple pleasures, so adjust your pace and enjoy country living at it's finest. There are many artists taking residence in the County. Follow the Arts Trail to say hello and peek inside their galleries and studios. Huff Estates features a fine art gallery and sculpture garden right on the estate (including a restaurant and inn). If you're stopping in for wine, be sure to visit the gallery and the garden. It's a dramatic setting in the quaint county. Where else would you find a giant sculpture of a zipper? That's Canadian. Many of the artists are Canadian and internationally recognized. Enjoy live music with the locals throughout the year in the County at various venues and festivals. Venues include everything from wineries to theatres. If you can align your trip with a great show at the Hayloft Dancehall, you're set. Drake Devonshire. I have this thing with floors. There are plenty of places to pick up treasures from your stay in the County. Here are a few of my favourites. You can also hop across the street to their newly opened home decor shop, Sand & Sumac. You can live the Jungalow dream at this sweet plant shop in Wellington. You can easily take home some "living art" from the The County. The hard part (but the best part) is choosing what to take home. Jessica will be happy to guide you through the selection of plants, pots, crystals and gifts with her expert style and tips. The Inn at Lake on the Mountain. Picturesque. Need more help planning your trip to The County? 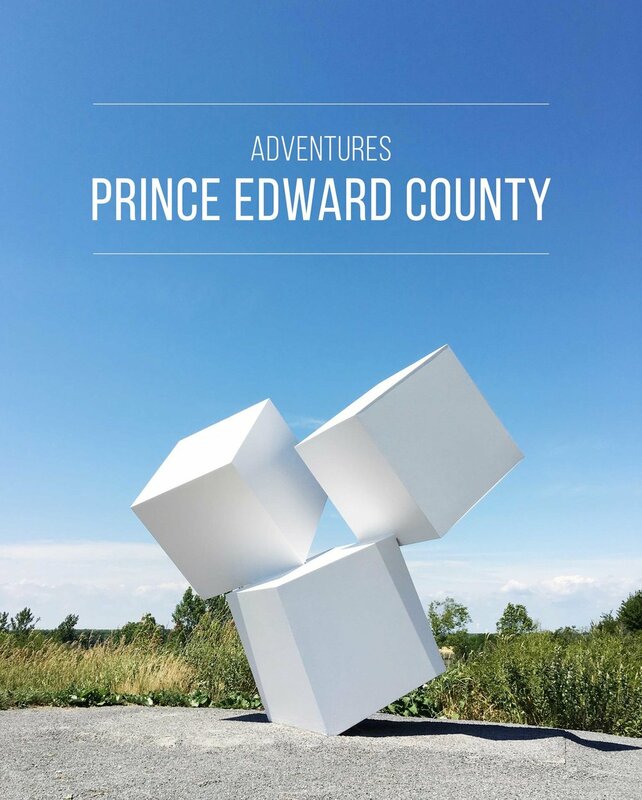 You can visit prince-edward-county.com for a comprehensive guide. The County Front Desk is also available to plan every detail of your trip. That's all, folks! Enjoy a little piece of the County. We sure are lucky to have such a special place so close to home. If I am missing anything, I'd love to hear your suggestions. We're already planning our next trip.